Organization: 2 teams of 5 playing field of 50x30, markers indicate endzone of 10yards at each end. 4 nets with end zones are "no go zones" and can only be used when an attacking player dribbles past a defender to score in one of the goals. Description: 1) Play begins with tthe coach playing ball into the white team who look to try and build play toward the opposite goals. In order to score, players must attempt to dribble past an opponent and into the end zone before shooting into one of the small goals. Normal rules of soccer with the exception that players must pla within the middle zone until an opportunity arises to dribble past an opponent and into the opponents end zone. The ball must be "kicked-in" when the ball goes out of play. 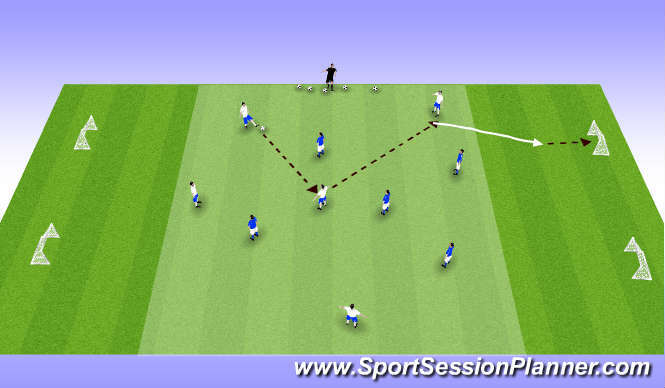 Variation: Last 5-10 min, one defender can recover back into the end zone to protect goals. - If you have room, take a long first touch to take space quickly. - Get head up to see what options you have. - Be positive- Run at the defender if you can turn. - Protectthe ball by putting your body between the ball and the defender. - Redirect the ball with the inside/outside of foot.